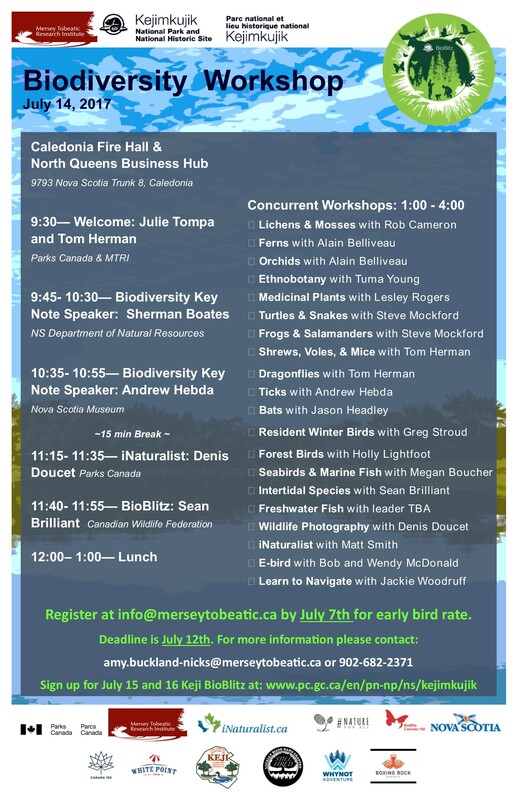 A notice has been circulating about a Maritime Forest Carbon Opportunity Conference, sponsored by the Nova Scotia Landowners and Forest Fibre Producers Association (NSLFFPA) and the Cape Breton Privateland Partnership (CBPP) to be held in Port Hawkesbury March 7 and 8th with a rain date of March 9th. Speakers and topics are cited on a website for the conference, led off by none other than Prof Peter Duinker of the Independent Review! He spoke recently to a Senate Committee about forests and climate change and a lot else. 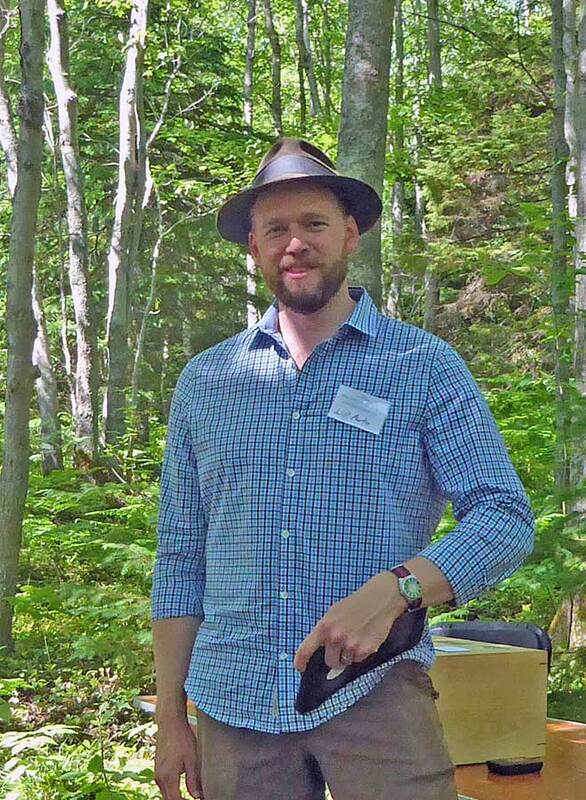 Nine speakers are listed currently including Dale Prest who has been highly active in promoting carbon offsets as an income generator for private woodlot owners in Atlantic Canada (see recent post) and has urged the NS Government to adopt a cap and trade system that openly trades with markets in Ontario, Quebec and California. So it should be an interesting conference, the Independent Review Report will have been completed, if not released, and there will likely be lots of discussion about it and the future direction of forestry in Nova Scotia. There is a $60 registration fee. Nova Scotia will implement a cap-and trade system in 2018. Join moderator, Dr. Meinhard Doelle, and panelists for a series of six free panel events on developing Nova Scotia’s cap-and-trade system.” Part 5 will be in Wolfville, place TBA. Intervale forest on Meander River, N.S. Place: Community room of the New Glasgow Library, 182 Dalhousie St. Presentation by Norris Whiston to NS Wild Flora Society. All welcome. Earth came with all the essential elements needed to foster life, but – it has taken a very long time and many biological transformations to make those elements into useable elements to foster the Earth’s current wealth of biodiversity. This presentation will cover a portion of the changes to Earth’s atmosphere, soils, and waters that have allowed our present life forms to exist. The presentation will also give some of the various roles many flora and fauna play in ecosystems and the effects of current human activities on those ecosystems. 2:00 p.m. at the Tantallon Library. Presentation to Nova Scotia Wild Flora Society. All welcome. 7:30 p.m. at Nova Scotia Museum of Natural History, 1747 Summer Street, Halifax. 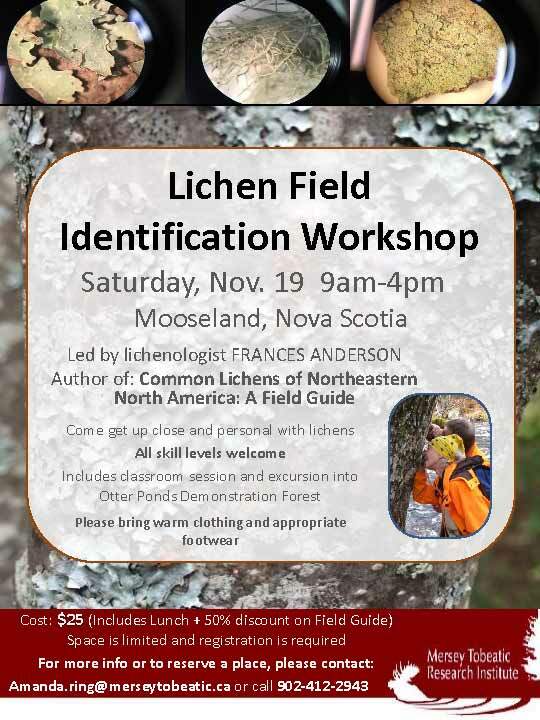 9 am to 4 pm, with Francis Anderson at Mooseland, NS. Click on image at right for details. 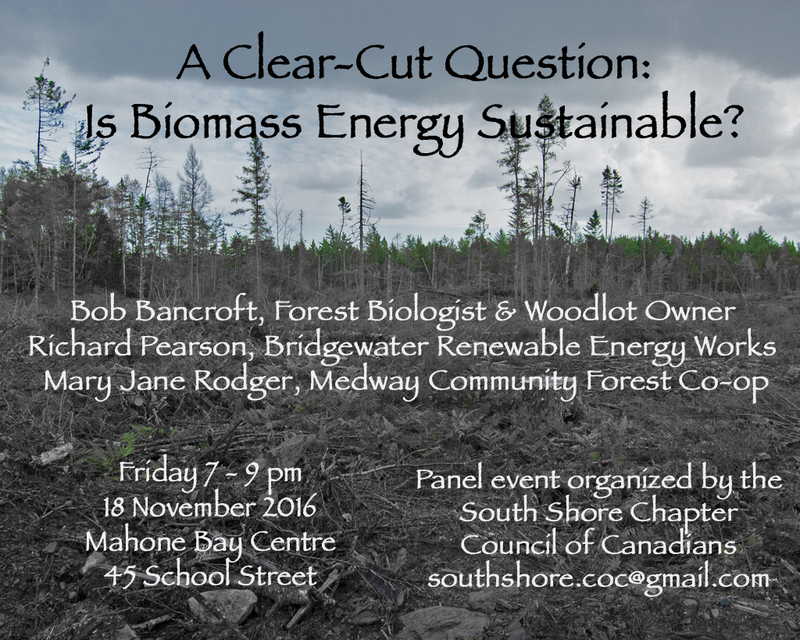 Friday Nov 18, 2016 Council of Canadians: Clear Cut Question”: Is Biomass Energy Sustainable? The Council of Canadians is sponsoring a panel discussion of a “Clear Cut Question”: Is Biomass Energy Sustainable? Panelists are Bob Bancroft, Richard Pearson and Mary Jane Rodgers. The discussion takes place Friday, November 18, 2016. 7-9 pm at the Mahone Bay Centre (45 School St. Mahone Bay). Bob Bancroft is a well known wildlife biologist and co-author of the 2010 Report Restoring the Health of Nova Scotia’s Forests who has argued that our forests are seriously overcut and that we need to give them a rest. Richard Pearson is a business person with a background in sustainable development who is promoting a small scale biomass energy project for Bridgewater. Mary Jane Rodger is with the Medway Community Forest Co-op. This project is a welcome initiative. Treed bogs and fens and wooded swamps are among Nova Scotia’s most common wetlands. No special approval is required for harvesting trees in these wetlands; minimal watercourse protection regulations apply (re: NS Wetland policy). In addition, roads through forested wetlands, and harvesting operations in the vicinity of forested wetlands can have serious effects on their functioning. Presentation by Donna Crossland, BSc, BEd, MScF. 1880 Clementsvale Rd., Bear River. 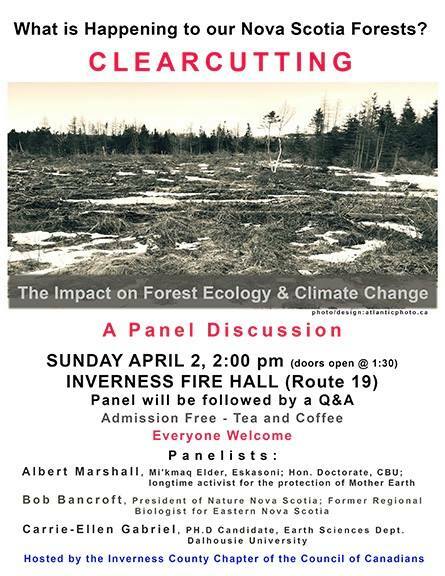 DNR (The NS provincial Department of Natural Resources) encourages us not to worry about clearcutting in public forests since harvest decisions are “science-based”. But clearcutting is more harmful in southwestern NS than anywhere else in the Maritimes. Why is our region so unique? Learn about some of the new (and inconvenient) “science” that has not been incorporated into DNR’s reality, from impacts to trout and salmon to the quality of the dirt that trees grow in. Savour some desert and sip delicious coffee/tea while discussing the ecology of our local woodlands. Donna welcomes discussion of how best to manage our Crown forests…which risk being managed by local mill interests for the next decade. 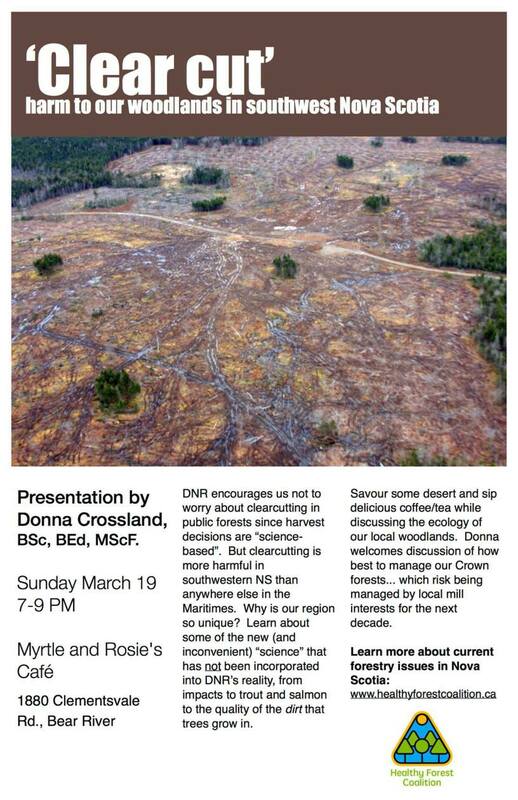 Thursday, March 23, 2017 HABITAT: the forgotten need of birds in the much-acclaimed, science-based forest management of NS. Donna Crossland talks to NS Bird Society. Taking a bird’s eye view of Nova Scotia’s recent forest management practices, the “science” that is used by NS Department of Natural Resources to claim that forest practices are sustainable, and the science that is conveniently ignored. Time to ‘stop listing’ and ‘start speaking’ on behalf of bird habitat. Donna Crossland was a National Park Warden for Parks Canada for 16 years. She is currently employed as a biologist at Kejimkujik National Park. Among her tasks, she conducts forest songbird surveys for Keji, as part of our forest monitoring program. Open to the public and refreshments to follow. 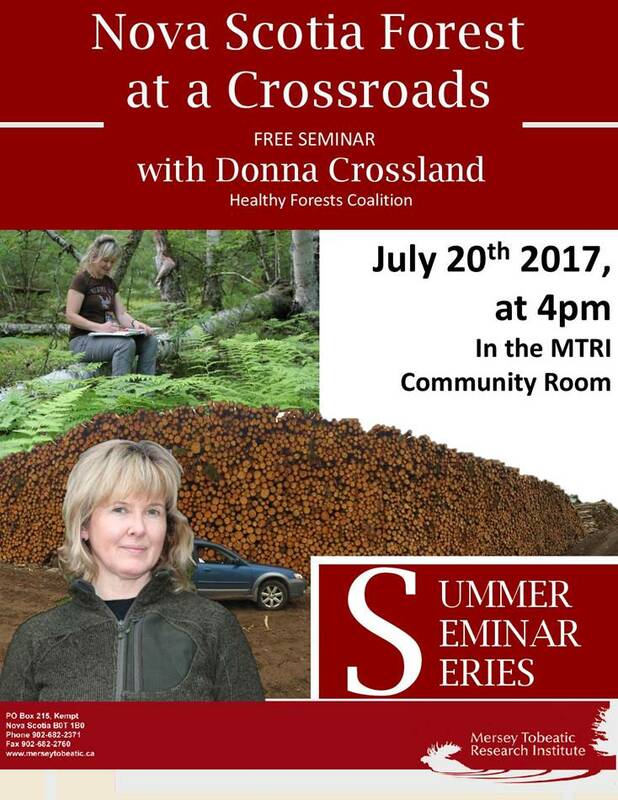 Sat May 13, 2017: Donna Crossland on Our Forest Our heritage. 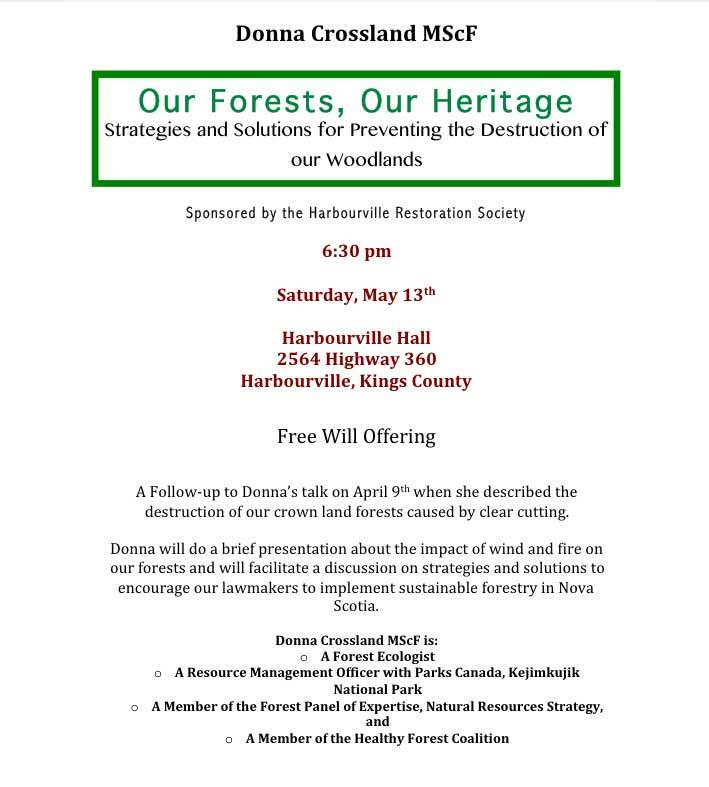 At Harbourville Hall, 2564 highway 360, Harbourville, Kings Co. Donna will do a brief presentation about the impact of wind and fire on our forests and will facilitate a discussion on strategies and solutions to encourage our lawmakesr to implement sustainable forestry in Nova Scotia. MTRI, the Mersey Tobeatic Research Institute, is based in Kempt, Queen’s County and is focused on biodiversity conservation and sustainable use of natural resources in the Southwest Nova Biosphere Reserve. The Biodiversity Workshop is their 6th annual science conference. It is being held July 14th at the North Queens Fire Hall in Caledonia, NS from 9:30am to 4pm. The workshop will cover 20 topics such as Ethnobotany with Tuma Young, Shrews, Voles, & Mice with Tom Herman, Forest Birds with Holly Lightfoot, Lichens and Mosses with Rob Cameron. View MTRI website for details, also on the poster at left, click on to enlarge). To keep track of upcoming forestry-related events of all sorts, see www.rurallife.ca/events/. Selected events are highlighted below. Donna Crossland, a co-author with Bob Bancroft of Restoring the Health of Nova Scotia’s Forests (2010), will be talking about forests and forestry in Nova Scotia in the Community Room at MTRI (Mersey Tobeatic Research Institute) on Thursday July 20th at 4 p.m.
Donna Crossland was interviewed recently by CBC Halifax Information Morning in the 4th of a series on the state of forestry in Nova Scotia, and in particular controversies surrounding cutting on the Western Crown lands by the WestFor consortium. Markus Zwicker, General Manager of WestFor Management Inc. who was also interviewed in the CBC series has been invited to talk about his perspectives sometime in the following weeks. MTRI is a “non-profit co-operative with a mandate to promote sustainable use of natural resources and biodiversity conservation in the Southwest Nova Biosphere Reserve and beyond through research, education, and the operation of a field station.” It is located near Kejimkujik National Park. View directions on the MTRI website for how to get there. 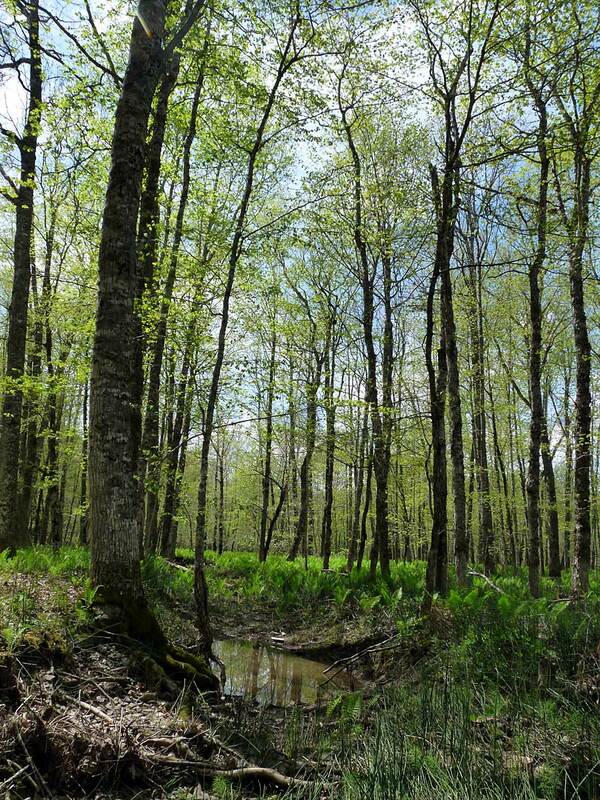 Participants in this year’s Backyard Forestry workshop will learn about basic forest ecology and how to work with a piece of land to encourage ecological and economical value. Topics covered will include: Identifying tree and shrub species, and their ecological roles in the forest; choosing which trees to cut and which trees to leave; how to promote wildlife habitat; what landowners can do to increase forest carbon storage; how our forests have changed, and what we can do to promote natural forests; what we can learn from natural disturbances in the forest; where to obtain funding for silviculture activities; legal issues such as wood theft and capital gains tax, and, the virtues of a “messy” woodlot. Full price $325. $100 deposit required to register. Registration is accepted up to two weeks before the workshop date. Private, non-industrial woodland owners provide more than half of the timber used by Nova Scotia’s forest products industry. Research, however, suggests many of these owners do not consider income from timber sales to be their primary reason for owning woodland. This study aimed to reach a holistic understanding of their attitudes and motivations using walking interviews on the owners’ woodlands and a grounded theory approach to analysis, in which explanations of the phenomena under study are induced from the data rather than being based on responses to survey questions or derived from a priori hypotheses. Forest landowners interviewed for this research were most concerned with the conservation – and ultimately the conveyance – of values that provide them with no immediate economic returns. The high value placed on these “gifts to a future world” offers a new way to think about the design of programs meant to encourage active management of private forestland. 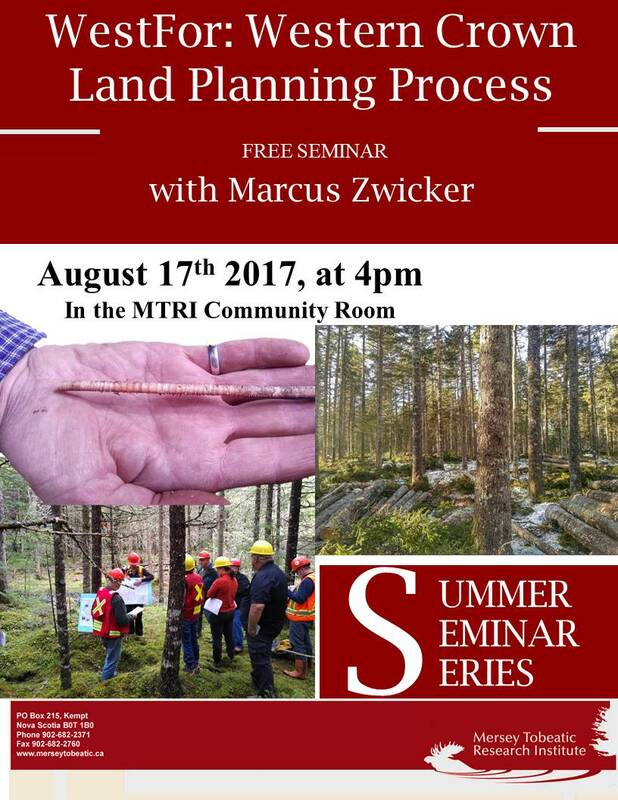 Marcus Zwicker, General Manager for WestFor, the consortium of mills managing the Western Crown Lands, will speak at the Mersey Tobeatic Research Institute at 4 pm, Thurs Aug 17 as part of MTRI’s Summer Seminar Series. These seminars are being live streamed and archived on the MTRI Facebook Page. – On Aug 10, MTRI’s Jason Henry and Lori Phinney talked about Chimney Swifts, Swallows and Bats (“Bugged Out“). 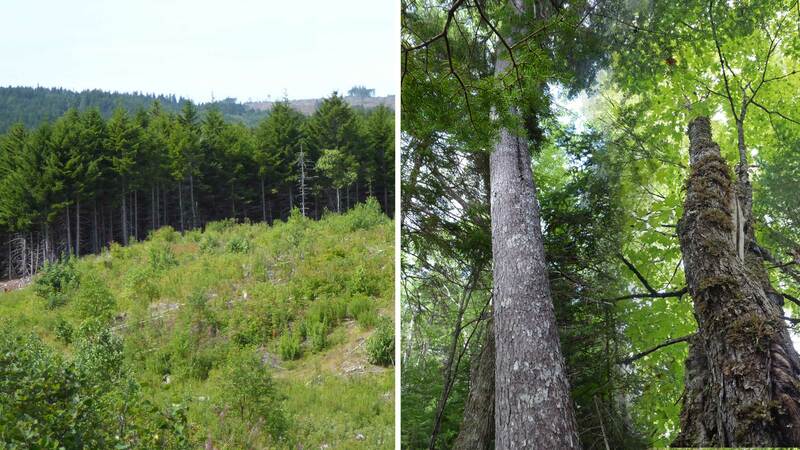 – On July 20, Forest Ecologist Donna Crossland talked about The State of Nova Scotia’s Forests. We can expect to hear a fairly different perspective from Mr. Zwicker. Zwicker and later, Crossland were interviewed earlier in the summer on CBC Information Morning. View posts on this website citing WestFor for some further background, news stories about WestFor. MTRI is located at , 9 Mount Merritt Road, Kempt, Queens County, Nova Scotia. View their Contact Page for driving instructions. 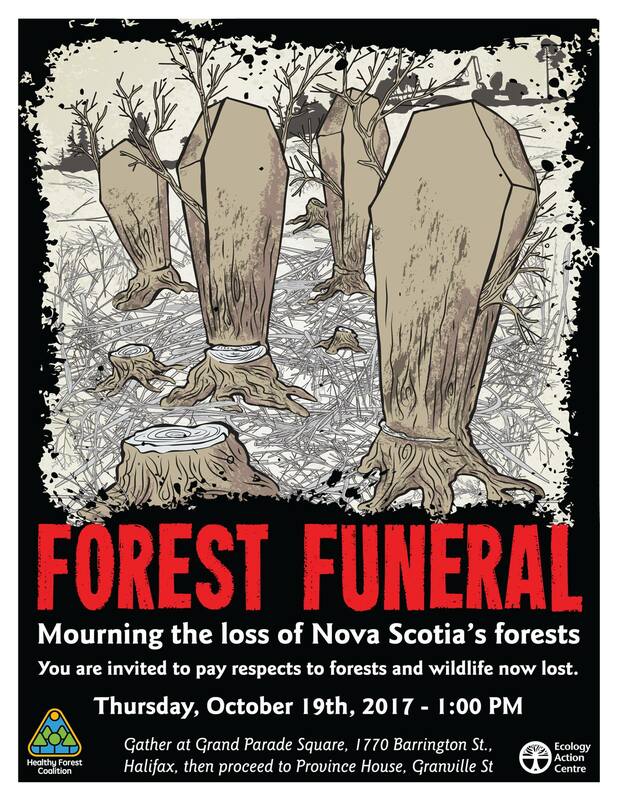 You are invited to mourn our forest losses with citizens from across the province. Please come to pay your respects to the once great Acadian Forest. An ‘open casket’ of tiny ‘logs’ will be followed by a procession of wildlife that have died through drastic losses of habitat. Pall bearers and forest mourners will walk from Grand Parade Square to the funeral ceremony at Province House. From there, the bodies will be carried to the very origin of forest mismanagement, the NS DNR office on Hollis Street. 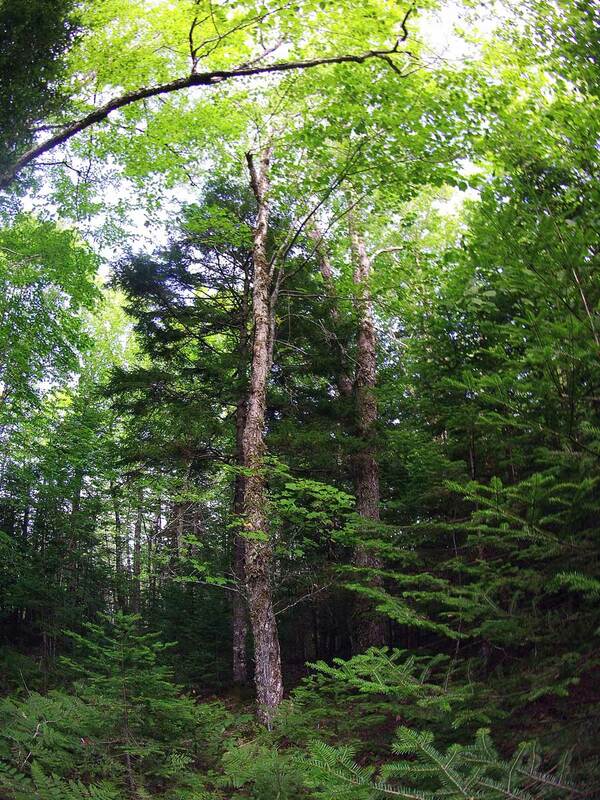 Over two decades, Nova Scotia’s forests are extensively clearcut. Is forest management really “science-based”? Does scientific guidance negate the need to reduce clearcutting by 50%? Satellite images reveal forest cover loss. Ecologically, impacts from forest management practices are far-reaching, even severe. NS’s soil nutrient levels are among the poorest in North America and cannot sustain these practices. The result? Displaced & homeless wildlife and rare native forests. 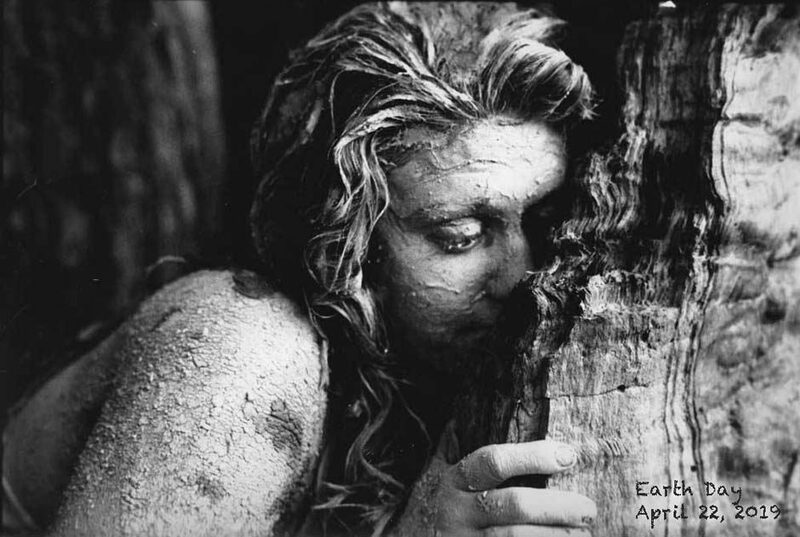 We’re surpassing ecological limits toward ecological collapse.